Product Code: BD 305761 Eclipse Needle, 25G x 1"
In needle-based safety devices, the safety mechanism is built into the needle. The needle can be manually attached to a conventional syringe or a commercially prepared prefilled syringe. BD offers either active or passive needle-based safety systems to meet clinician preferences. Active system. Safety mechanism is activated by the clinician after the injection. BD Eclipse and BD SafetyGlide syringes use active systems. Passive system. Needle is automatically shielded after the injection. 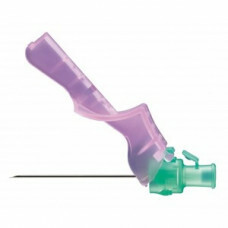 BD AutoShield Duo Pen Needle uses a passive safety mechanism. SmartSlip Technology, available on select small gauge needle sizes, is designed to help ensure a secure connection to luer slip syringes.